NCR Veteran Ranger Coat is an appealing choice if you are looking for full coverage. 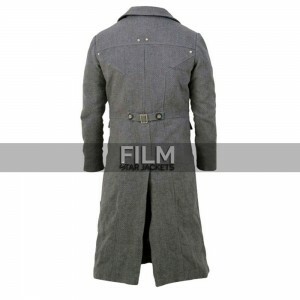 The coat is made from high quality leather. The stitching is premium, you will be amazed by the quality as you wear it. The coat itself is a bit baggy but it still looks good. It has wide style collar and an open front layout. The back of the coat has a cape which has white logo printed on it. The color of the coat is brown but the inner lining provided is black in color. Each of the characteristics of the Fallout New Vegas coat is enough to engage me with its magnificent and beguiling appearance. Round flaps over the shoulders and covering at back made me realize that I’d be looking very unique after wearing Armor leather coat. This full length Fallout New Vegas Coat is my best purchase so far. It’s hard for me to believe I have got it at such a great price. Everything is just perfect! Surely buy more from you. Film Star Jackets replied: Thanks Paul for your thoughts! It's really amazing how fast it got here. I live in the US and it took 4 working days for the coat to arrive. the fabric is splendid en really warm. If you want the Fallout new vegas coat. Then buy this one. It's worth a lot more then the cheap price it costs. "This unique coat was suggested by my friend and I am very grateful to him for recommending such a splendid outfit. It is rare by every means. It is al"
"I loved this Crimson Peak coat in the picture a lot and when I saw it in reality my love increased more, the day I have purchased it I am enjoying wea"